Cat lovers are you reading us? If yes, we have got some great coupon deals for your cat in this post. Are you ready to save the next time you go to buy your cat’s food? Oh you definitely are. Who doesn’t like saving some pennies, be it cat food. 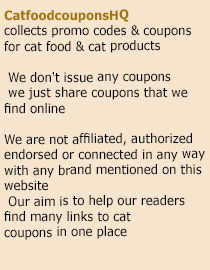 Now we do not wish to keep you impatient, so will get to the point and share with you some amazing cat food coupons you will have to print! The first offer is by Fancy Feast. They are providing $1 off on buying 18 cans of Mornings or Elegant Medleys packs. If your cat does not eat that, here is another offer by them: The Fancy Feast Company is offering $1 off on buying any 24 cans of Fancy Feast Gourmet Cat food as well. Are you afraid that there is nothing for you over here as your cat likes none of these; well we have got another coupon that offers $1 off on buying one package of Fancy Feast Gourmet Dry Cat food, be it any variety. Another great coupon deal is being offered by Purina One. They are offering $1.75 off on one bag of Healthy Metabolism Cat food and two cans of Wet Cat Healthy Metabolism. Woho! We have got some good cat food variety over here and you can choose the best for your cat! Here is where to print the coupons from: http://www.digitalrewards.com/purina .Don’t miss out on these coupons! I would like to be notified if you have coupons for fansy feast for appitzers. Can they be purchased in bulk (ex. 12 or 24 )?